Don’t ignore these big savings just because camera cashback sounds complicated – there’s real money to be saved! Camera cashback schemes remain ever popular with manufacturers because it enables them to offer special short-term discounts without driving down the long-term recommended retail price. They’re typically seasonal too; so you’ll often see winter, spring and summer promotions – meaning some photo enthusiasts can actively wait to make a purchase during those months in anticipation of saving a few £s. However, be aware that cashbacks more usually – yet not always – apply to models that have been in the market for a while, rather than the latest and greatest kit. While it can be a means of a manufacturer and their retailer partners clearing older stock before or shortly after newer models arrive, that’s not to say any great-looking cashback deal – sometimes also termed ‘bonus offers’ – should be sniffed at. And on occasion we’ve been surprised to see more recent models included too, albeit with slightly less generous savings. Typically, cashback offers can range from £25 upon purchase of a flashgun or lens to a few hundred on a DSLR body or pro-end piece of glass. Generally the higher priced the item to start with, the higher the cashback value to tempt you into a purchase. As a consumer, receiving cashback means you have to jump through a couple of hoops to get your saving – usually involving the registering of the equipment you’ve bought online, the completion of a redemption form and the inclusion of proof of purchase (i.e your receipt) – but we’d advise that overall it’s a win-win for you, the retailer, and the manufacturer of the camera, lens or photo accessories in question. So let’s take a look at how camera cashback schemes work and why are they so popular with camera companies as a way of creating the best camera deals around. 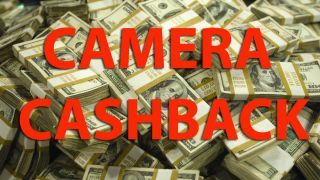 For starters, when you buy a camera or a lens or any other camera kit with a cashback deal, you still initially pay the price quoted without the cashback discount. To get the cashback, you then have to fill in a form to claim it back from the manufacturer in question. All it means is that you don’t get your saving straight away – and you do need to remember to claim it! Claims are typically required within a month of the current cashback scheme ending. The application for cashback is usually online, and is obviously well worth the small amount of administrative effort that it takes. So when you see a deal that includes a cashback offer, remember that you have to claim this back from the photo manufacturer and you don’t get this discount at the checkout. The other thing to remember is that cashback offers get rolled out across all authorised dealers. If one of them has a cashback offer from Canon, Nikon, Olympus or any other maker, you can bet they all have it! IMPORTANT: Do be aware that some retailers will quote prices with the cashback already applied, as if you’ve already claimed it, so check the small print (and the price you actually pay). Other retailers will quote the price you pay at the checkout and put the discounted price with cashback applied in smaller print underneath. Keep this in mind when you’re comparing prices because you need to make sure you’re aware of both the checkout price and the final cashback price when comparing dealer prices.